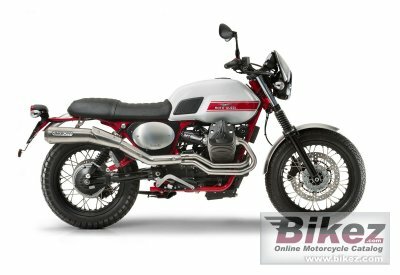 2018 Moto Guzzi V7 II Stornello. Picture credits - Moto Guzzi. Submit more pictures. Built on the technical base of the iconic and ultra popular V7 II, a model was created suited for riding on any type of terrain, from congested city traffic to a pleasant solo or two-up ride on the roads that bikers love best. The new Stornello completes the already wide range of V7 II motorcycles made up of the Stone, Special and Racer models. Price as new (MSRP): US$ 11190. Prices depend on country, taxes, accessories, etc. Comments: Switchable ABS. Limited edition model. Ask questions Join the 18 Moto Guzzi V7 II Stornello discussion group or the general Moto Guzzi discussion group. Get a list of related motorbikes before you buy this Moto Guzzi. Inspect technical data. Look at photos. Read the riders' comments at the bike's discussion group. And check out the bike's reliability, repair costs, etc. Show any 2018 Moto Guzzi V7 II Stornello for sale on our Bikez.biz Motorcycle Classifieds. You can also sign up for e-mail notification when such bikes are advertised in the future. And advertise your old MC for sale. Our efficient ads are free. You are also welcome to read and submit motorcycle reviews.